TORONTO, July 26, 2015 /CNW/ - The excitement of the TORONTO 2015 Pan Am Games reached a final crescendo tonight as nearly 40,000 people — athletes, coaches, volunteers, officials and very loud, enthusiastic and dancing Games supporters — gathered for one last party: the Pan Am Closing Ceremony. The ceremony's theme, unity through diversity, reflected the enthusiasm and camaraderie of the Games, as well as the cultural pride of the 41 participating countries and territories. Live Nation, the Official Live Music Partner for the Games, and B5C Productions, a joint venture involving Toronto-based BaAM Productions and FiveCurrents, developed the production. During the ceremony, Toronto-born singer Serena Ryder performed "Together We Are One," the official song of the TORONTO 2015 Games, and international superstars Kanye West and Pitbull also performed. The highly successful Games were embraced by the people of Toronto and the Greater Golden Horseshoe region, with 1.05 million tickets sold, making for a fun and celebratory atmosphere as athletes gave it their all in 36 sports. After so many thrilling performances and wonderful memories, the audience applauded as the Games cauldron was extinguished, signaling the official closing of the TORONTO 2015 Pan Am Games. As the flame faded, the internationally acclaimed Hamilton Children's Choir sang "Shine Your Light." Four years from now, the Pan Am cauldron will be lit in Lima, Peru, Host City of the 2019 Pan Am/Parapan Am Games. "Tonight was more than a Closing Ceremony. It was a victory celebration — your victory celebration — all of you. At these Games, hope won out, optimism prevailed and community spirit carried the day," said Saäd Rafi, TORONTO 2015 Pan Am/Parapan Am Games Organizing Committee (TO2015) chief executive officer. "To the athletes and coaches, thank you for the courage, athleticism and thrilling moments. We built you podiums, but you lifted us a little higher." There is much more world-class sport competition in store for the Greater Toronto Area this summer. The largest Parapan Am Games ever begins Friday, August 7, and runs through Saturday, August 15. All 15 sports are Paralympic qualifiers for Rio 2016. Don't miss these fierce competitors, and buy your tickets now at TORONTO2015.org/tickets. Live Nation, the Official Live Music Partner for the TORONTO 2015 Pan Am/Parapan Am Games, and B5C Productions, a joint venture involving Toronto-based BaAM Productions and FiveCurrents, are the producers of the Pan Am Closing Ceremony. 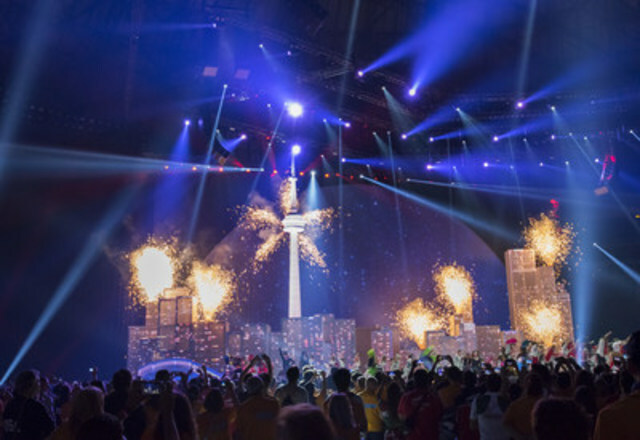 The TORONTO 2015 Pan Am Games Closing Ceremony celebrates the dedication, diversity and unity of Toronto. It creatively tells the story of the many cultures that are interwoven into the fabric of this land and highlights the warm-hearted nature of its people, who have welcomed the Americas with the hospitality Canadians are known for. Above all, the Closing Ceremony honours and celebrates the athletes who committed themselves and have demonstrated excellence through sport. This once-in-a-lifetime experience brings the world together to reflect on the Games and to celebrate unity through diversity. The stage is a vast and bespoke playing area with many levels and points of view, including three main stages and numerous runways connecting the space between. Geometric cubes and sculptures ring the far edge of the stage and draw the eye upwards to the 65-foot-high backdrop that towers over the playing area. These sculptures and the backdrop change appearance throughout the evening, providing a framework for every moment on stage, from protocol segments to lively creative presentations. Athletes and volunteers experience the Closing Ceremony from standing positions on the field of play, surrounding and filling in the stage areas. Music plays an integral part in the Closing Ceremony. The musical direction is a hybrid of classical and electronic music, with captivating melodic lines and sustained rhythms to elevate each of the performances. The centerpiece creative segment, "Toronto By Twos," is a completely original composition created expressly for the occasion. The Closing Ceremony also showcases the talents of international superstars Kanye West and Pitbull, along with Canadian sensation Serena Ryder. Toronto-born singer Serena Ryder performs "Together We Are One," the official song of the TORONTO 2015 Games. The song reflects the enthusiasm and camaraderie of the Games, as well as the cultural pride of the 41 participating countries and territories. Through a combination of song, dance, performance, scenic projections and imagery, the many cultures of Toronto and the countries and territories of the Americas are celebrated. Performances seamlessly overlap and blend in a symbolic gesture of unity in the connective threads we all share. Constructed of steel from Hamilton-based ArcelorMittal Dofasco, the cauldron, its shape inspired by a female pine cone, is colourful, vibrant and fun — reflecting the Games motto, United We Play! To signify the official closing of the TORONTO 2015 Pan Am Games, the cauldron is extinguished. As the flame fades into history, the internationally acclaimed Hamilton Children's Choir, selected for their connection to the origin of the cauldron's creation, sings "Shine Your Light," a moving song with an inspirational message to keep the flame of hope alive for generations to come. In exactly four years, on July 26, 2019, Lima, Peru, will host the 2019 Pan Am/Parapan Am Games. In a lively and colourful performance, Peru's rich history blends past with present as its roots are still an integral part of its modern culture. As Peru is brought to life in Toronto, the performance culminates in the unveiling of the Lima 2019 logo. The logo symbolises the flower of Amancaes. The flower and its pistils represent three athletes with open arms and the three Americas, with the identity of Lima. As Toronto bids adieu, Lima looks forward to welcoming the world in 2019!